The last time I was at Belle Isle, the almost 1,000-acre island park in the Detroit River (the largest in the United States), was in the mid-1980s. I don't remember if I was there to go to the aquarium (which closed in 2005) or the zoo, but I know I haven't been there since. Today, Belle Island is most known for the Detroit Grand Prix, the Indy Car League auto race around the island, but that hasn't taken place since 2008 due to the automotive industry's economic crisis. Crime has kept many in the Metro Detroit Jewish community from venturing down to Belle Isle in recent decades, but a young cadre of Detroit Jews is set to change that. Come Play Detroit's Justin Jacobs planned a dodgeball game on Belle Isle that would seek to break the world record for most people playing in one game of dodgeball. Yesterday's game had 1,800 players (a good number in Judaism) and was ESPN SportCenter's #10 play of the day. 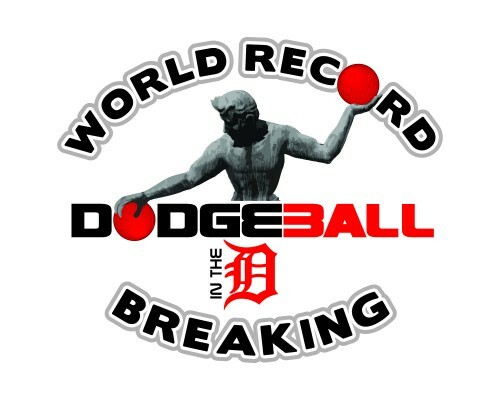 While it wasn't enough to set the world record (2,136 in Rochester, NY), it was an impressive showing. Jacobs tells me that sports leagues for young Jewish Detroiters will continue on Belle Isle with softball and kickball leagues. And speaking of kickball, there is a kickball tournament in Los Angeles today (Kick for Detroit) that is sponsored by Community Next and seeks to reconnect young adults with the city of Detroit and raise money for improvement projects in Detroit. As I've written before, we are seeing a real renaissance here in Detroit and it's being led by young members of the Jewish community. This is making headlines around the country. Rabbi Yonah Bookstein wrote about the rebirth of Jewish life in Downtown Detroit today in the Jewish Journal Los Angeles today, citing such initiatives as Motor City Moishe House, Repair the World, and the saving of the landmark Isaac Agree Downtown Synagogue. Matisyahu stood out in front of the crowd. He had just stage-dived head first off of a 15 foot-high stack of speakers from the side of the stage. The crowd held him aloft and returned him to the stage as if rehearsed. Lights made the already stifling heat even more unbearable. How they could continue to play? Yet, an hour into the show, the pace and intensity of the music was growing. The crowd jumping up and down to the beat of the music. Rivers of sweat ran off the drummer who was shirtless by the end. With over 1,000 people packed into the air-condition-less hall, many took turns outside on the front steps of St. Andrews. It was that hot inside. When the band finished, and walked offstage, the crowd would not leave. They started to chant for more. Matisyahu, already drenched head to toe, returned with his signature anthem of peace, “One Day.” He brought dozens of concert-goers on stage to accompany him. St. Andrews Hall pulsed with sweat, cheers. Across the room of outstretched arms the crowed chanted the words at the top of their lungs unmoved by the searing heat. Earlier in the day, a few miles from the venue, I brought Matisyahu to visit the newly established Motor City Moishe House. The community and residents transformed a historic home which once housed a venerable rabbi of yesteryear into a communal home, part of the national Moishe House network. In this blighted neighborhood, Detroit’s Jewish community is banking on this collective to be a hub of programming for young adults. Theough opened only months ago, at least fifty people showed up with just two days notice to meet the singer and enjoy a vegan feast prepared by a young kosher caterer. When I was growing up in Detroit in the 1970’s and 80’s, the notion that Jews would return to the city — literally the areas of old Detroit that housed the core of the community for a hundred years — was a remote fantasy. The community had been moving to the suburbs since the 1950’s. By the time I was born, the Jewish community, all the synagogues and temples had moved to the suburbs. My parents choice to live in the city was never quite understood. Two small shuls stuck it out. It’s no secret that Detroit is on the ropes. The city is a shadow if its former self, even with gorgeous new stadiums for baseball and football. Miles of the city have been razed and nature is reclaiming them. Miles of empty commercial real estate line the streets of the sprawling suburbs. Corruption and mismanagement were rampant and reached their zenith when the mayor was arrested two years ago. However, Detroit’s Jewish community, who live almost entirely in the suburbs, is not ready to give up on a city that has such a rich and vibrant Jewish past. In addition to the new Moishe House, and a Repair the World volunteer, a landmark synagogue recently was saved. The Isaac Agree Downtown Synagogue was about to close its doors and sell their building after 90 years. The situation had been so bad that they needed to recruit the bartender of a nearby night club to make a minyan. A group of my contemporaries, old shul members, and younger Jews have banded together and saved the shul. The compelling saga was even covered by NPR who ran a story about it. Detroit’s Jews are resilient and instead of closing the Downtown Synagoge, they celebrated their 90th with 300 people. I'm looking forward to taking my family to Belle Isle. It's been too long! UPDATE: I forgot to mention that there was also a bike tour of Old Jewish Detroit yesterday in which 150 bikers got to see the old neighborhoods and landmarks of Jewish Detroit up close. Here's a link to the Detroit Free Press coverage.